To ensure you are delighted with your custom made arbor, fence, gate or deck -- you want to choose the right wood for your arbor, deck, fence or gate. In Los Angeles, the popular woods used for exterior projects vary in terms of cost and quality, as well as their ability to resist the elements (water, sun and pests), provide visual appeal in color and appearance and be maintained. You will need to select wood for two purposes ... the framing or the substructure used to support the weight of the structure ... and the wood used for fencing, decking or trim. The first type of wood to choose is the wood to be used for your substructure or hidden framing. Pressure Treated Wood ~ For hidden framing, I only use pressure treated lumber. This wood is treated with a variety of chemicals to make it resistant to termites and rot. In the last year, a major change has been made to the preservatives used -- they are safer for the environment but less effective. Redwood ~ For visible framing, such as gate and fence posts and cross pieces, you can upgrade to redwood for a better appearance. There are different woods available depending on the type of project you are interested in. 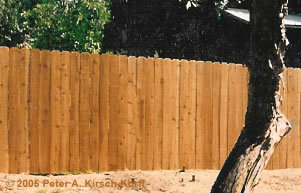 There are several popular choices for fence boards. Once you have chosen the boards, I pick the appropriate wood for your trim and posts. Based on your needs and budget, I can also build fences out of other woods and some composite materials. 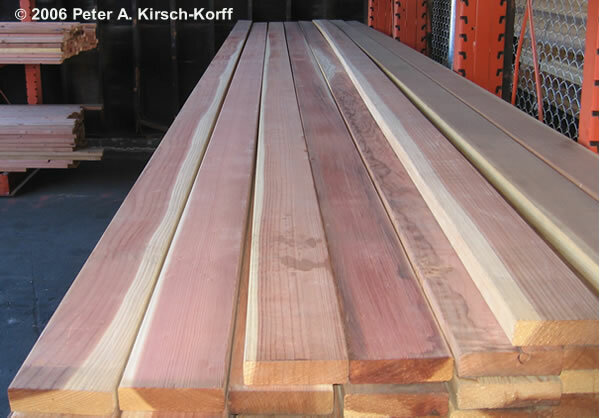 Redwood ~ A distinctive pink/red colored wood which ages to gray. The red heartwood is naturally resistant to damage from termites and moisture. Any white part of a redwood board, known as sapwood, has little resistance to termites and rot. I use Construction Grade Heart Redwood, commonly known as Con Heart, which has no sapwood and some knots. For trim, I hand select the best clear redwood with the least amount of sapwood possible. 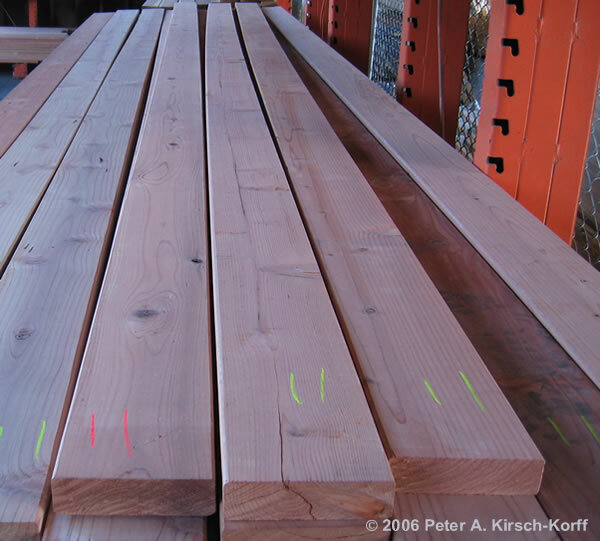 I can also use more expensive grades of redwood, if your budget permits. Mangaris™ (Red Balau) ~ A dense grained, reddish-brown hardwood (see photo) from Indonesia/Thailand that ages to a silver gray like Teak. It stains up like Mahogany and is more durable than Redwood. See the rich color of the unstained wood. "Ironwoods" ~ A chocolate brown family of heavy and durable South American hardwoods, including Ipe and Pau Lope. They offer excellent termite and weather resistance. However, they are somewhat more labor intensive and costly. There are several popular choices for deck boards. Once you have chosen the boards, I pick the appropriate wood for your trim, posts and railings. Based on your needs and budget, I can build decks out of other woods and composite materials. 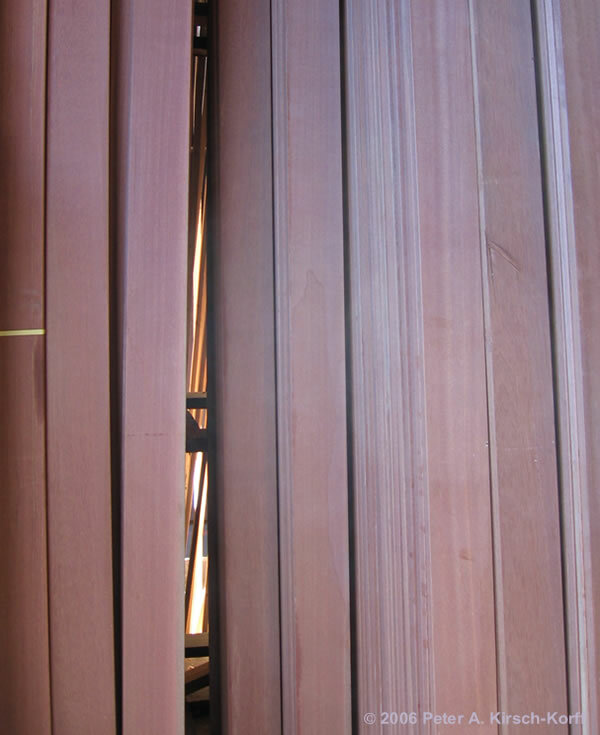 Redwood ~ A distinctive pink/red colored wood which ages to gray. The red heartwood is naturally resistant to damage from termites and moisture. Any white part of a redwood board, known as sapwood, has little resistance to termites and rot. I use Construction Grade Heart Redwood, commonly known as Con Heart, which has no sapwood and some knots. I can also use more expensive grades of redwood, if your budget permits. Mangaris™ (Red Balau) ~ A dense grained, reddish-brown hardwood from Indonesia/Thailand that ages to a silver gray like Teak. It stains up like Mahogany and is more durable than Redwood. It costs about 10-20% more than redwood and is moderately more labor intensive. See the rich color of the unstained wood. "Ironwoods" ~ A chocolate brown family of heavy and durable South American hardwoods, including Ipe and Pau Lope. They offer excellent termite and weather resistance. However, they are considerably more labor intensive and it costs about 10-20% more than redwood. There are two choices for these larger structures. Based on your needs and budget, I can also build tree houses out of other woods. 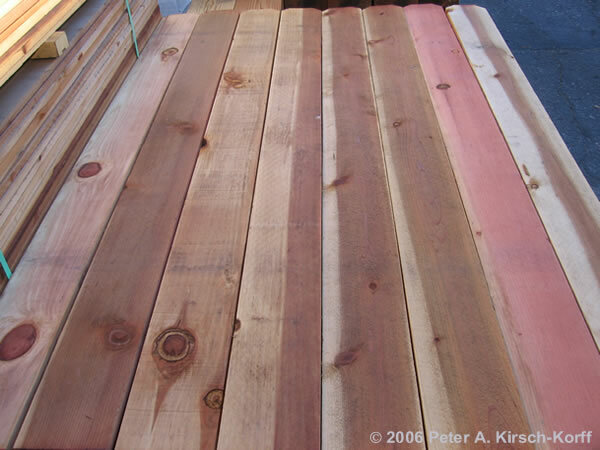 Redwood ~ A distinctive pink/red colored wood which ages to gray. The red heartwood is naturally resistant to damage from termites and moisture. Any white part of a redwood board, known as sapwood, has little resistance to termites and rot. I use Construction Grade Heart Redwood, commonly known as Con Heart, which has no sapwood and some knots. For a beautiful and durable structure, this is your most cost effective choice. I can also use more expensive grades of redwood, if your budget permits. Mangaris™ (Red Balau) ~ A dense grained, reddish-brown hardwood from Indonesia/Thailand that ages to a silver gray like Teak. It stains up like Mahogany and is more durable than Redwood. For a high end structure of exceptional durability and striking looks, consider Mangaris. See the rich color of the unstained wood. These 2 x 6's are used in framing. The distinctive perforation pattern helps the preservative penetrate deeply into the wood. These 4 x 4 and 6 x 6 posts are used for framing. 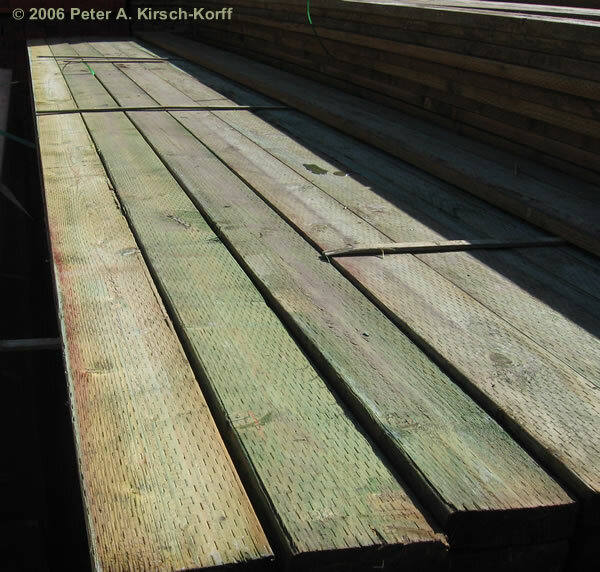 Popularly used grade for decking. Completely red (heart) wood with some knots. Grade that is "clear" of knots but does contain sapwood thus offering excellent appearance but impaired longevity. I use it only for decorative trim after hand selecting boards with the least amount of sapwood. 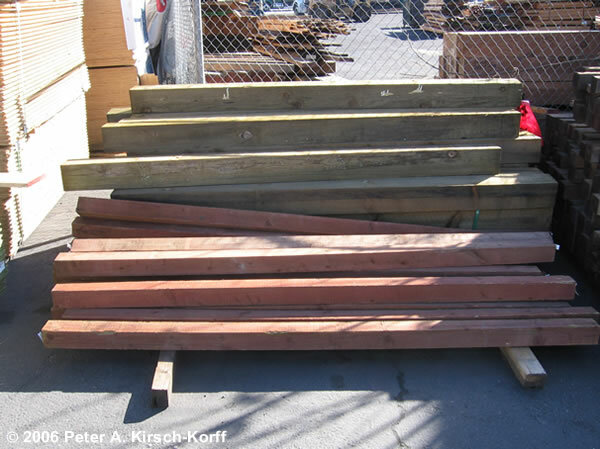 This lowest grade of redwood fencing has too much sapwood to be used for a high quality fence. These are the standard dog eared fence boards which I use in many of my designs. 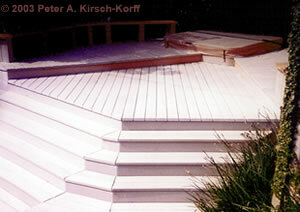 This fine grained, clear hardwood makes for beautiful garden architecture, especially decks. This timber comes from managed forests in Indonesia and Thailand and combines some of the best attributes of Mahogany and Teak -- and helps support the economic development of the third world. The most popular of the composites, Trex™ comes in many styles and colors. Note: Mangaris is a trademark of Tata Enterprises, Inc. Trex Wood Polymer is a trademark of Trex Company, L.L.C. All other trademarks are the property of their respective owners.